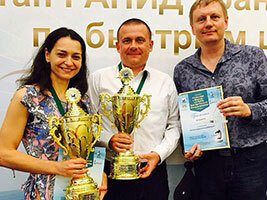 On August 24 the Irkutsk Grand Prix Rapid crowned their winners, GM Rublevsky for the men and GM Kosteniuk for the women. 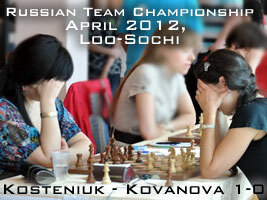 Lots of very strong Russian Grandmasters were playing. In the men’s at the top were 1. 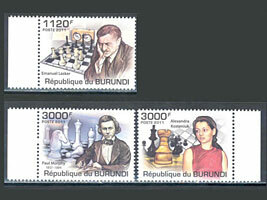 Rublevsky, 2. Artemiev, 3. Bocharov, and for the women 1. 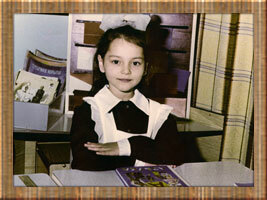 Alexandra Kosteniuk, 2. Girya, 3. Lahno, 4. Ubyennyx and 5. Gunina. Link to the organizer’s page. 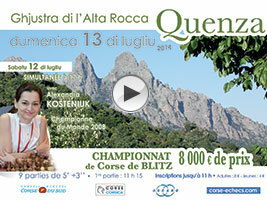 In case you were planning a summer vacation in Europe, consider going to the beautiful island of Corsica, where on the Sunday July 13 will take place the Corsica Blitz Chess Tournament. 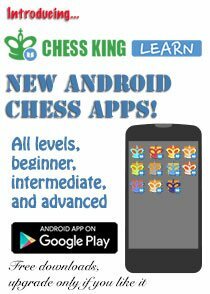 Check out the official poster below, the organizers page with an introduction video in Corsican language and a mate in 1 puzzle, and some of my blitz games below. 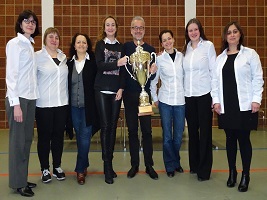 I was last time in Corsica and won a match against French women’s champion Sophie Milliet (see post, photos, and the YouTube video). Let me know if you will come to Corsica and play chess, it’s only one day of chess and lots to visit on one of the most beautiful islands in the world: Corsica! The 2012 Flims National Swiss Championship just ended today, with the final victory of GM Joe Gallagher with 6.5/9, followed by GM Pelletier and me GM Kosteniuk with 6/9. See the full results and photos below. I am pretty happy with my “+3″ result, with 4 wins and only 1 loss, which will make me win approximately 12 ELO points and bring me to about 2490 ELO (I’m working to get back to my record of 2540). 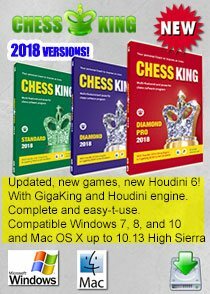 I had some good games against Zueger and Gerber, and Chess King has already posted my game against Korchnoi at this link. 1. GM Joe Gallagher (Neuenburg) 6½. 2. GM Yannick Pelletier (Fr/Sz) 6 (24,25). 3. 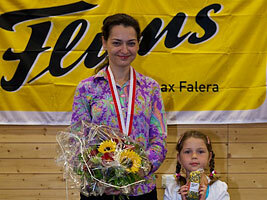 GM Alexandra Kosteniuk (Rus/Sz) 6 (24). 4. IM Oliver Kurmann (Luzern) 5½. 5. IM Julien Carron (Bramois) 4½. 6. IM Markus Klauser (Belp) 4 (16,50). 7. IM Richard Gerber (Genf) 4 (14,25). 8. IM Beat Züger (Siebnen) 3½. 9. IM Alex Domont (Nyon) 3. 10. GM Viktor Kortschnoi (Wohlen/AG) 2. 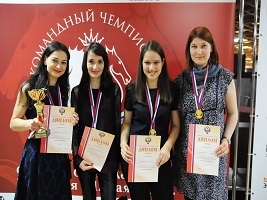 Today I’d like to share with you a detailed analysis of my game from the recent Russian Team Chess Championships from Loo-Sochi against Baira Kovanova. It’s a very interesting Ruy Lopez opening and shows a nice battle of a good Knight against a bad Bishop. 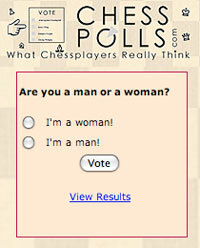 To publish my game on my blog I entered the game into Chess King and used the easy Export-to-Blog button. 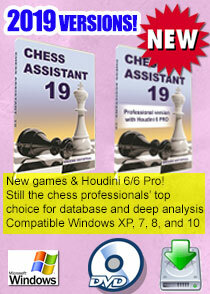 Watch my Game LIVE against Mungultuul, decisive for the Tournament win! 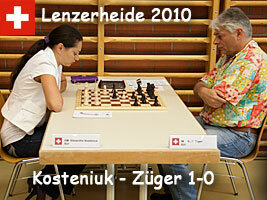 Update February 6, 2011: The game just ended in a hard-fought draw, which benefits Alexandra since she has a better Berger coefficient (she beat stronger players such as Zhao Xue). 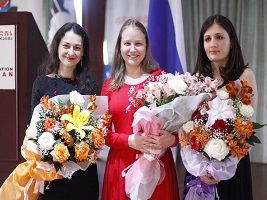 So the big winner of the 2011 Moscow Open Women’s Invitational Chess Tournament is Chess Queen Alexandra Kosteniuk! 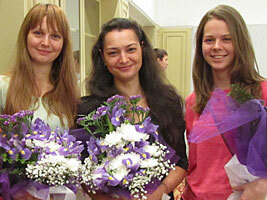 Read the post about the 2011 Moscow Chess Open on www.chessblog.com. 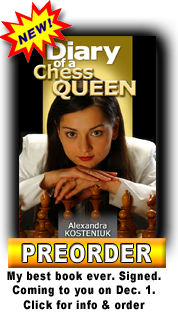 Chessqueen is pleased to present Alexandra Kosteniuk’s Moscow Open’s Game LIVE, played right now February 5, 2011, against Jolanta Zawadzka. 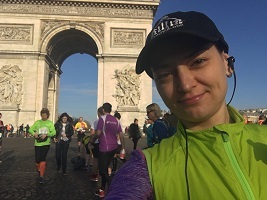 Update: Alexandra Kosteniuk won. 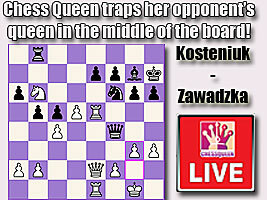 Black’s Queen got caught in the middle of the board! Click more… to see the game. I just want to let you know that I passed the milestone of 100,000 followers on Twitter. 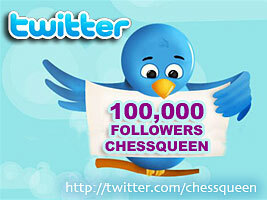 Twitter has now become a major social network with millions of members, and as you can see lots of chess players. 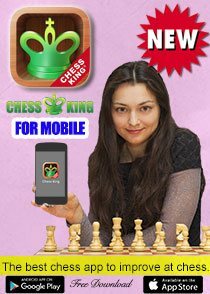 You can visit my Twitter page at http://twitter.com/chessqueen and sign up to follow my updates (it’s free to join Twitter). 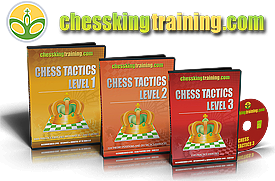 There are some Chess GM’s on Twitter, a good list can be found on twitterchess.com. Check out also my Facebook page & YouTube channel. Today was the first round of the National Swiss Chess Championship in Lenzerheide, and I won against International Master Beat Züger (ELO 2405). 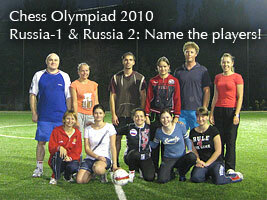 The tournament has 10 players and will run 9 rounds, one game against each player, from July 8 to July 16, 2010. See the diagram below for a nice series of moves. In this position it’s white to play and win.